I remember during my pregnancy, while listening to music with the laptop perched on my belly, that the baby always seemed to kick more while I played this song. Remember? Well, the other night I wanted to see if that kicking was a sign of her loving or hating the music. Turns out she liked it. So much that we got a string of (involuntary) smiles. 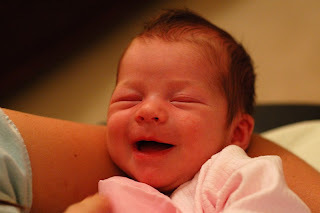 A glimpse at what her little smile will be like in another few weeks, and my heart melted. COMPLETELY.